King Philip’s Stephanie Nasson was strong at the relay at the South Sectional and even better at the state meet, winning the 500 free in 4:57:87. She also won the 500 at the South meet. Only a sophomore, Marrkand has already made her mark, earning All-American honors in the 200 IM with a meet-record time of 2:02.78 in the Division 1 state meet. Her win in the 100 butterfly at sectionals (55.29) also earned an All-American nod and her 100 free victory (51:52) helped Westford to the Division 1 team state title. Making her second appearance as swimmer of the year, Tocci had a senior season to remember, winning two individual state titles in the 50 free (24.35) and the 100 free (52.88) to defend her titles in both events. The three-time DCL All-Star and 11-time state champion will attend Boston University. Alexander was one of the dominant distance swimmers in the state, capturing the 200 IM (2:04.96) and the 500 free (4:59.00), helping her team to a third-place finish in Division 2 States. She also won both titles at the North Sectionals, in 2:05.06 and 4:57.31, respectively. Experience isn’t always a requirement in the biggest meets, and this freshman proved that. Avila finished second in the 100 butterfly (57.70) and the 200 free (1:51.92) at states. She was the North Sectional champion in the 100 free (52.48). She has competed in the Pan-Am Games as a member of the Honduras National Team. Already the record holder of all Arlington diving records, Bernadin captured the North Sectional title this season with a 478.1 and followed that up with a second-place finish at states. She’s an honor roll student who competes for Charles River Diving. The senior led his team to its second consecutive EIL Invitational victory. He placed first in the 200 IM and 100 breaststroke and swam on two winning relays (200 medley and 400 free) in the same meet. He was named All-EIL in four events. Only a sophomore, Chamberlin had a breakthrough season in the 100 backstroke by capturing the South Sectional title in 57.71. A week later she blitzed the field at the Division 2 state meet, shaving two seconds off her time to win the event in 55.62. Griffin won the Division 1 state title in the 50 free (24.62), helping propel the Warriors to a second-place team finish. She was the DCL champion in the 100 butterfly and took third in states. An Under Armour All-American in lacrosse, she will attend Middlebury. No stranger to this page, Huber defended her state title in the 100 breaststroke with a time of 1:07.18. She also nabbed her third straight North Sectional title. She is a three-time DCL All-Star, a high honors student, and also a member of the soccer team. The Hockomock League MVP Nasson was nearly unbeatable in the 200 and 500 free this year, winning league, South Sectional, and Division 1 state titles in the events. Her 4:55.43 time in the 500 earned her All-American consideration. The five-time state champion will swim at Boston University. Following in the footsteps of her All-Scholastic brother Sean, the younger O’Brien captured her first state title this year, posting a 461.80, after finishing second in the North Sectionals. A member of the track team, she is an honor roll student who also competes for the Heritage Swim and Tennis Club. Wayland won North Sectional and state team titles despite not winning a single event, and Pierce was a testament to that depth. She was a part of the third-place 200 free and fourth-place 400 free relay teams and also finished third in the 200 IM and seventh in the 100 butterfly. The freshman was named MVP of the EIL. A top-10 New England swimmer since the age of 8, this season Reis qualified for the Winter Senior Nationals in Atlanta and the Grand Prix Meet in Austin, Texas. Reis swims year-round with the Exeter swim team. Westergard excels at acrobatics both in the pool and on dry land. She was the Division 2 state diving champion, posting a 452.35 following up last year’s runner-up finish. On dry land she is also a USA Level 10 gymnast who competes year round with New England Sports Academy. While it came up short in its bid for a team state championship, Weston’s relay teams were second to none, taking home the top prize in all three relays. In the 200 free, Julimar Avila raced out to an early lead and Victoria Bryson kept the pace going in the second leg. East Longmeadow closed the gap but Katie Kim and Stephanie Palocz held them off for the win. In the north sectionals, this quartet set the state record, winning in 1:35.64, good eanough for All-American honors. In the 400 Free Relay Avila once again gave her squad a lead, and Kim held up her end of the bargain. This time Marblehead began to close the gap, but the senior experience of Pierce swimming third, and the Division 2 Swimmer of the year Tocci was enough to hold off the Magicians and take home the title in the meet’s final event. As a group, Avila, Kim, and Bryson will be back next year to try to defend their relay titles, while Pierce, Tocci, and Palocz will graduate. After setting the meet record a year ago, this talented group nearly broke it this season. While it came up just short, their 1:47.97 finish was nearly three seconds ahead of the field. Jen Marrkand set a blistering pace with a 26.68 first leg. Kelly Huber swam the fastest second leg to take a commanding lead and Courtney Martin and Tori Weinstock closed out the win as the grey Ghosts took home the Division 1 team title. The second of the Wildcats two state championship relays teams, the 400 free team of Katie Kim, Bianca Tocci, Julimar Avila, and Maddie Pierce turned in a winning time of 3:31.59 at the Division 2 finals. The team did even better at the North sectionals, recording a first-place time of 3:30.37. Tocci and Avila were both double winners in individual events as well. 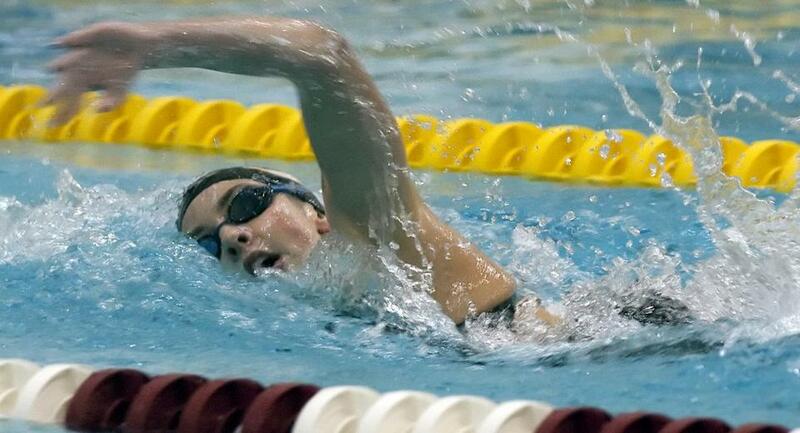 Wayland’s state and sectional title wins were a testament to depth as not one swimmer took home an individual title but so many were in contention it was enough to win by 50 points. The Warriors finished the year 14-0 and ran their dual-meet win streak to 78. Klick is no stranger to this page - as a swimmer and track star at Chelmsford in the 1990s she earned six All-Scholastic nods. In her eighth year as coach she helped Westford to its first state title after finishing second a year ago. Bay Colony — Barnstable: Rachel Butler, Caroline Ells, Rainey Kelly, Meghan Mamlock, Christy Partin, Lindsay Partin, Julia Wareham, Hayley Weik. Bridgewater-Raynham: Kelsie Clark, Caissie Niles. Coyle & Cassidy: Kyle Perry. Nantucket: Sophie Davies, Alexa Dragon, Cara Garufi, Eliza Steadman. Nauset: Marie Chamberlain, Allie Dadoly, Molly Drake, Annie Harris, Whitney Knowlton Wardle, Olivia Miller, Shylee Stewart, Hannah Walsh. Sacred Heart: Kylie Davis. Dual County — Arlington: Brooke Bernardin. Bedford: Brooke Jameson, Olivia Jameson. Concord-Carlisle: Rachel Andre, Abby Gramaglia, Meghan O’Brien, Sarah Poirier, Cassidy Smith. Lincoln-Sudbury: Ansley Baker, Megan Griffin, Emma Jarczyk, Catherine MacKeen, Alicia Perry, Clara Shealy, Kimberly Yang. Wayland: Kristina Barakov, Hallie Cramer, Anna Downs, Saya Higano, Carolyn Jones, Madison Kiefer, Mindy Lou, Courtney Murtagh, Megan Pierce, Isabel Schwartz, Heather Wright. Westford: Kelly Huber, Jen Marrkand, Courteney Martin, Jayne Pilachowski, Mayra Tynan, Tori Weinstock. Weston: Julimar Avila, Victoria Bryson, Kate Kim, Stephanie Palocz, Maddie Pierce, Mikaela Thompson, Bianca Tocci. Hockomock — Attleboro: Sarah Nordberg. Canton: Shannon McLaughlin. King Philip: Celeste Carey, Emily McQuaid, Stephanie Nasson, Sydney Nasson, Carly Schnabel. Mansfield: Rose Aldo, Marissa Gabrilowitz. North Attleborough: Aidan Devers, Sarah Hargrave, Julia Hausmann, Catherine Roukhadze, Julia St. Pierre, Ashley Walnut. Oliver Ames: Jacquey Gover, Haley Gula, Candace Sheehan. Sharon: Tana Bao. Stoughton: Taylor Goodrich. NEPSAC — Bancroft: Kim Le. Berwick: Jenna Hayden, Kelsey Hayden, Isabel Reis, Caroline Seekins. Cohasset: Mike Livingstone. Dana Hall: Abby Benkert, Emma Benkert, Caroline Joannes, Justina Zuckerman. Dover-Sherborn: Carolyn Body, Morgan Furber, Mary Keough, Connor McCormick, Julia Pearson, Kate West. Franklin: Alyssa Carle. Marblehead: Megan Alexander, Ryan Alexander, Toireasa Rafferty-Millett, Hannah Verrette. Norwell: Jessie Westergard. Pingree: Erin Cunningham, Emma Gaquin, Simi Harrison, Molly McSweeney, Veronica Monteiro. Portsmouth Abbey: Ceara Bowman, Sean Buckley, Nick DeLieto, Chris Soriano, Tim Tsung.